Just a couple miles across Calibogue Sound from Harbour Town lies Daufuskie Island, a small, largely undeveloped barrier island begging to be explored. As the weather cools in October, it’s the perfect time for a day trip to the island. A 45-minute ferry ride up the Intracoastal Waterway whisks visitors back in time when, depositing them on Daufuskie — accessible only by boat — and a world away from from the trappings of modern-day life. 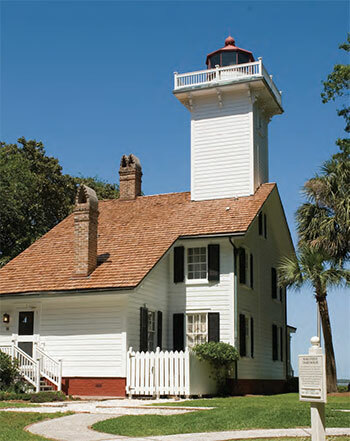 Bluffton is the last remaining example of a Lowcountry antebellum planters summer colony. And since cultural tourism is a growing trend and studies show those who are interested in history spend more money on their vacations than traditional tourists, local leaders are happy to woo them. But it wouldn’t hurt locals to learn about where they live, either. Without a bridge to the mainland, freed slaves and their descendants have shaped Daufuskie Island since the end of the Civil War. Their strong and unique Gullah culture was deeply influenced by their African heritage and remained largely isolated until the 1970s. The island had no electricity or telephone service until the 1950s, and oysters and cotton drove the economy — though today, tourism has become the most important source of income. But Daufuskie’s history starts long before Africans and Europeans arrived. The word “Daufuskie” comes from the language of Muscogee Indians and means “sharp feather,” describing the island’s distinctive shape. Artifacts and piles of ancient oyster shells left over from that time date back more than 9,000 years.